Happy New Year to all J&M readers, and special congratulations to Vedran from Kent, who became a Patron in November last year. I gotta admit, Mo is right. There is nothing funny about either of them. Get welfare to take unbelievers money. You’re starting the new year off with a real winner, Author. 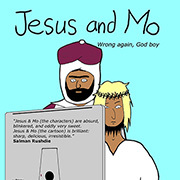 No, there’s nothing funny about Jesus and Mo, unless we step back a bit, gain a little of your wonderful perspective, and laugh loudly at the complete idiocy of their followers. Mock on, Author. Mock on. funny? no, but those two are scarier then Freddy Krueger. Nothing pisses off believers more than mockery. Except possibly the existence of atheists. Oh, well, maybe atheists who mock religion would be worse. So I guess the worst would be gay atheists who mock religion. I sense a business opportunity. A good start to the year, Author. Very well played. The first rule of survival in bar-fighting is NEVER PICK ON THE LITTLE GUY! A big guy can hurt you and might teach you some manners, but a little guy will just kill you. That said, Jesus, especially, had best keep in mind the old observation that Jesus was nailed to a cross and that Thor has a hammer. Beware. Freddy Krueger as a bill collector?! Now that’s frightening. You’ve heard of “Dunning Krueger”? Jesus and Mo are false prophets who should be mocked and cast away. We all know Brian is the real messiah. Someone: He’s not the Messiah – he’s a very naughty boy! I thought everyone knew that! Somewhere the scattered remains of an irony meter just spontaneously combusted. Son of Glenner: I say he is and I should know, I’ve followed a few! I am still reeling from a conversation I had with a hand-wringing liberal in a Manchester bar. He took offence when I rightly corrected him on the historical nature of Mo. Instant racist and islamophobic tag when you relate any violence to the so called prophet of peace! Brings back memories. Fortunately, our instructor never subjected us to the hands on approach 🙂 .